There are many ways to create inviting and engaging exhibition stands. What should they see first? What information will they want from you? What tangible or intangible thing will the audience will take away from their interaction with you at the exhibition? Large design elements like hanging banners big graphics, tall build exhibition stands are what catch people’s attention first. 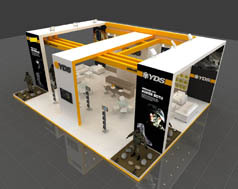 An effective exhibition stand design is comprised of two factors: Invitation and engagement. Large design elements invite people to take a closer look. Banners and signage are two examples of inviting design choices, they catch the attention of passersby and invite them to come closer. Once your audience comes closer to your booth, they’ll notice engaging details. More detailed signage, product examples, and interactive design elements draw people further into your booth space and encourage them to participate in the experience you’ve created for them. Large design elements like hanging banners big graphics, toll build stands are what catch people’s attention first. Trade show exhibitions are full of other vendors just like you and customers are going to be bombarded with information. All exhibition stands are made to draw their attention and your competitors will be using many of the same attention-drawing tactics. For this reason it’s especially important to put a lot of effort into the large-scale marketing materials you’ll be using at your booth. Do not cut costs on the large design elements, that will be used in your exhibit space. It’s better to spend a few extra money at the outset, than be forced to replace a poor-quality banner, sign, or tent later on.